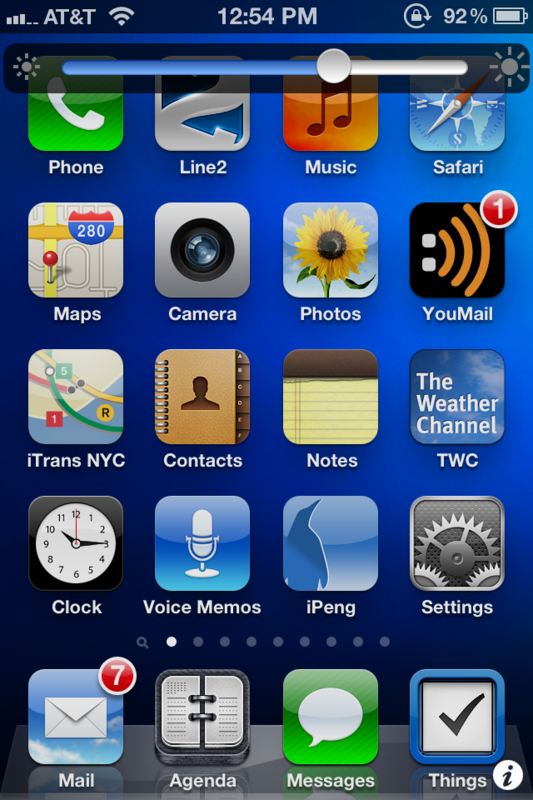 I decided to “jailbreak” my iPhone 4 the other day. I did it for one reason and only one reason: I wanted a quick and easy shortcut to adjusting the brightness of my screen, and now I have it! I just double-click the status bar and a handy slider comes up no matter what else I’m doing. No more digging 3 or 4 pages deep just to make a quick change! 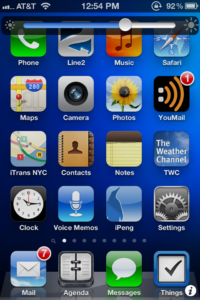 Maybe going through the trouble of jailbreaking for this one feature is a bit excessive (it’s actually really easy – more on that in a second), but it’s the one major flaw I wrestle with in the standard iOS5 my phone came with. The auto-brightness is useless – it does virtually nothing – and I find that I adjust the brightness more often than I adjust the volume on my iPhone. Hopefully you see my motivation. Jailbreaking is actually really, really easy, though your results may vary so do your research. I took advice from the folks over at LifeHacker.com (I take their advice for a lot of other things) by following the instructions on their “Always Up-to-Date Guide to Jailbreaking Your iPhone.” Within an hour I was jailbroken and I installed the Brightslide app that you see in the photo. I thought I’d browse a bunch of the other apps that “Jailbreakers” swear everyone needs, and you know… Meh… I just haven’t found anything else that gets me excited. In fact, I mostly just gained an appreciation for just how difficult it is to create a UI experience as perfectly as Apple does. Any other app I tried required watching videos or reading articles on how to make it work. When was the last time I had to read a manual for an Apple product? The “Activator” app that comes with Brightslide is pretty amazing, and yes, I guess some folks will find it awesome to get to change your icons to look like crayon drawings, or put a photo of Kate Beckinsale in the background of your text message app. Me, I’ll stick to easy-to-read icons and the real poster of Kate on my wall. So far no regrets on the Jailbreaking. I’ll keep looking for something else useful to do with it, but for now I’ll just go adjust my brightness.